Preparing Herbal Teas: Peppermint, Chai, Chamomile ... Oh my! Is there anything better than brewing a hot or iced cup of tea to help you wind down? It’s time to put those herbs to good use by creating the PERFECT cup of tea. 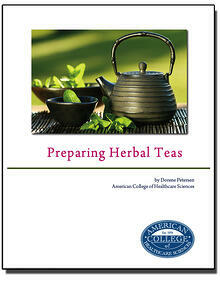 Download the free eBook Preparing Herbal Teas, written by ACHS President Dorene Petersen! Enjoy the healthful benefits of herbs and easy ways to use them in teas. Download the free eBook today!